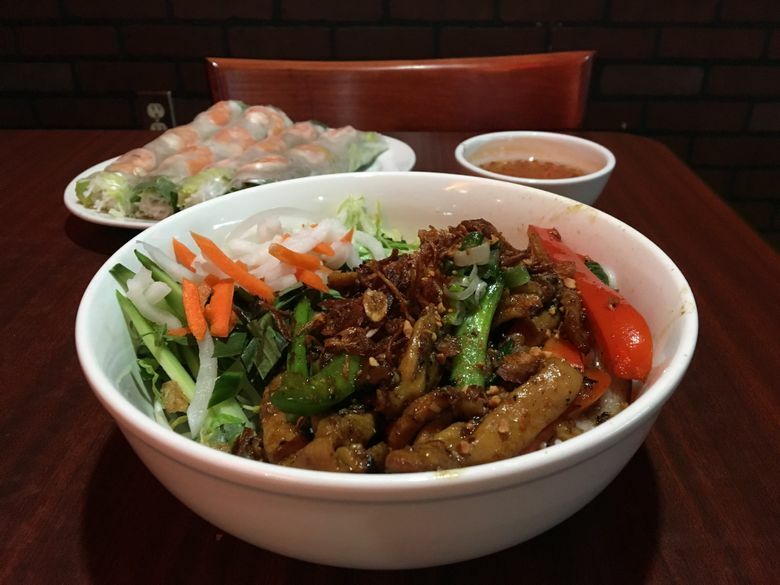 Billiard Hoang in Columbia City, a billiard hall/sports bar/restaurant hybrid, has some pretty great Vietnamese dishes for meal time or late-night cravings. If a restaurant’s hole-in-the-wall-ness were a measure of excellence, Billiard Hoang in Columbia City would get pretty high marks. Not because it’s hard to spot along Martin Luther King Jr. Way S. — on the contrary, it has a pretty large parking lot out front — but because the restaurant portion of the establishment is nestled in the back corner of a dimly-lit billiard hall/sports bar. In other words, not the first place one might look for Vietnamese food in a city rich with good Vietnamese restaurants, sans dive-bar vibes. But its billiard tables belie its robust menu, from banh mi sandwiches to pho to vermicelli bowls. On a recent weekday, midafternoon, the place was nearly empty, save for a few older gentlemen playing pool. Food orders were taken behind the bar, near a colorful mural of Mount Rainier and some flat-screen TVs broadcasting sports channels. And, given that I was the only dining patron, the food arrived at my table pretty quickly. The menu: Noodle soups, rice-and-meat plates and 16 different banh mi sandwiches (many of which include scrambled egg — more on that later) occupy most of the menu’s real estate. Other food offerings include both fresh and fried spring rolls, congee, vermicelli bowls and Chinese doughnuts. If you’re feeling thirsty, several shakes (including avocado and durian) and fresh juices can help with that, as well as some very inexpensive booze ($3.50 for a beer!). A pot of tea comes at no extra charge. Don’t miss: The BBQ pork with egg banh mi sandwich was a warm bundle of deliciousness. (You can request it sliced in half if you want your first bite to get right to the good stuff.) 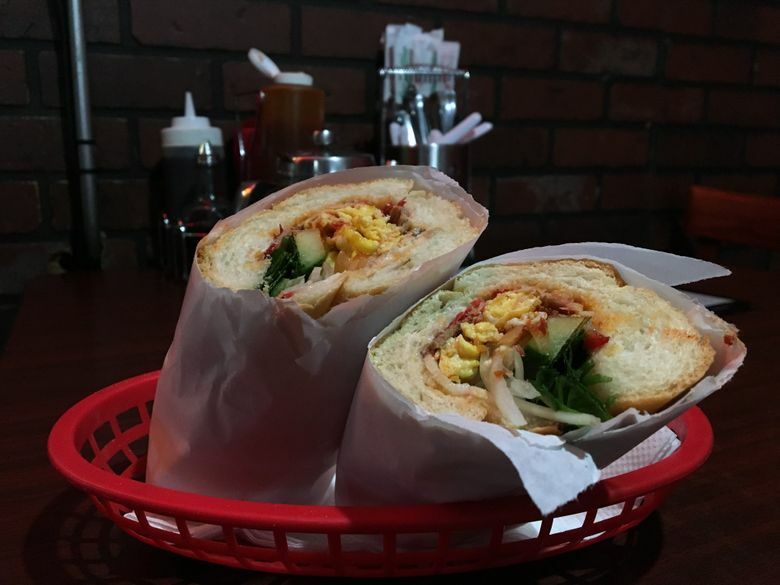 I’d go out on a limb and say you can’t really go wrong with any of the banh mis with egg — judging by Billiard Hoang’s Yelp page, they’re a major draw for diners. And rightfully so. The scrambled egg added a nice fluffy texture to the crisp of the French bread and crunch of the raw cucumber, onion and cilantro. (Note to those with strong opinions on cilantro: There’s a lot of it.) A bit of hot chili sauce added a kick. What to skip: The shrimp spring rolls were substantial in size and tightly packed into the rice paper, but unfortunately even the peanut sauce (also served with a dose of hot chili sauce) that accompanied it couldn’t mask the slight fishy taste in the shrimp. Prices: The spring rolls ($10), BBQ pork with egg banh mi ($4) and the lemongrass chicken vermicelli bowl ($12) amounted to $26 before tip, and was more than enough for two.